Please click HERE to fund ACDMPV research through the ACDA, NORD Research Fund or The David Ashwell Foundation (UK/Europe). A simple and automatic way for you to support the ACDA every time you shop, at no cost to you. 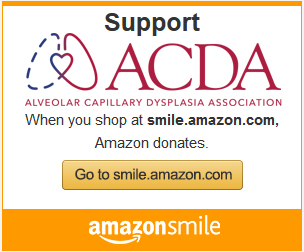 At smile.amazon.com, you have the exact same low prices, vast selection and convenient shopping experience as Amazon.com, with the added bonus that Amazon will donate a portion of the purchase price to ACDA. The Amazon Smile Foundation will donate 0.5% of the purchase price from eligible Amazon Smile purchases, excluding shipping & handling. Donations are made to the ACDA by the Amazon Smile Foundation and are not tax deductible by the purchaser. Buy – You can find whatever you’re looking for on eBay – from baseball cards to new cars and more. When you do, shop for items that benefit us. You can get a great deal and support ACDMPV research at the same time! Shop now to support ACDMPV research. When buying on ebay, ensure that the ACDA will display in checkout by adding the ACDA as a favorite either in your Donation Account or through the ACDA’s ebay for Charity page; Go to: ACDA ebay for Charity. Then click on the red heart “Add to My Charities” Button. As a Buyer, you have the choice to add a donation on each transaction to benefit the ACDA. Sell – You can also support ACDMPV research when you sell on eBay. Just designate our organization to receive 10-100% of your final sale price the next time you list something for sale. Did you know that charity listings often get more bids and higher prices than regular eBay listings? Boost your sales and support our critical work while you’re at it! Plus eBay gives back to you too, with a fee credit on your basic selling fees. Sell now to support ACDMPV research. To Sell on ebay and donate a percentage of the profit for ACDMPV research, click the ebay for Charity link below, then at Step 2, select the % donation and Step 3 click ‘List My Item’ and create your listing as usual. You can adjust the donation amount when creating the listing. Our online store through Spreadshirt ships internationally and includes items for sale featuring the ACDA logo with a designated portion of the sale supporting the ACDA. T-shirts are just the beginning of the products offered…check out our store to see hoodies, baby clothes, buttons, mugs, drinkware, phone cases, tote bags, doggie bandanas, ornaments, etc. The ACDA earns a commission equal to 20% of every product sold! Giving Bean is a gourmet coffee roaster providing a variety of freshly roasted whole bean and ground coffees, fine tea, gourmet cocoa, chai, and biscotti to the continental U.S. The ACDA earns 25% of almost every item sold. All coffee is roasted-to-order (whole bean or ground) and arrives fresh, assuring its great taste. Prices are $12 for a standard bag of coffee and tea, comparable to other high quality coffees and teas, with lots of flavors including Sunrise Breakfast Blend (medium roast), Bold Reserve, French Vanilla, Caramel Creme, Chocolate Raspberry, Cinnamon Hazelnut, Pumpkin Spice, Organic Heritage Blend, etc. Please click HERE to go directly to the ACDA supporter page and 25% of any purchases made through such link will go to the ACDA. If you live in the UK or elsewhere in Europe, there are a number of options available for funding ACDMPV research through The David Ashwell Foundation, which was created by Simon Ashwell and Amelia Lake Ashwell, ACDA parents to David (March 4, 2011 – March 19, 2011). You can make a donation directly, using the Virgin Money giving website to gather donations for your fundraiser. Fundraise while you online shop (The Giving Machine) (a percentage of what you spend is donated). Fundraise when you ebay (ebay for Charity).